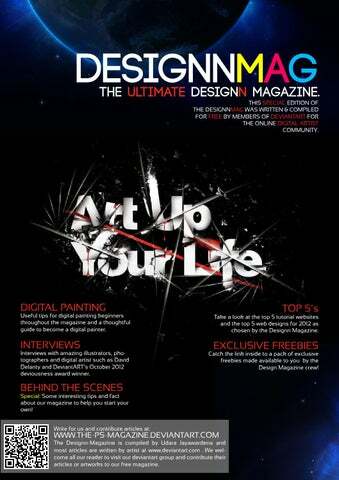 The ultimate Designn magazine. This special edition of The DesignnMAG was written & compiled for FREE by members of DeviantART for the online digital artist community. Useful tips for digital painting beginners throughout the magazine and a thoughtful guide to become a digital painter. Interviews with amazing illustrators, photographers and digital artist such as David Delanty and DeviantARTâ&#x20AC;&#x2122;s October 2012 deviousness award winner. Take a look at the top 5 tutorial websites and the top 5 web designs for 2012 as chosen by the Designn Magazine. Catch the link inside to a pack of exclusive freebies made available to you by the Design Magazine crew! www.the-ps-magazine.deviantart.com The Designn-Magazine is compiled by Udara Jayawardena and most articles are written by artist at www.deviantart.com . We welcome all our reader to visit our deviantart group and contribute their articles or artworks to our free magazine. Interviews with amazing illustrators, photographers and digital artist such as David Delanty and DeviantART’s October 2012 deviousness award winner. BEhinD tHE Scenes Special: Some interesting tips and fact about our magazine to help you start your own! www.the-ps-magazine.deviantart.com The PS-Magazine is compiled by Udara Jayawardena and most articles are written by artist at www.deviantart.com . We welcome all our reader to visit our deviantart group and contribute their articles or artworks to our free magazine. 17 18 Advert Freebies download link. Make-A-Magazine Some behind the scenes. Web Designing A beginners guide. The Crew Who’s behind it! Video Post-Production. A complete guide. Top 5 Design Websites As chosen by the Designn Magazine. Stuff to buy! Some amazing! new gadgets and inventions. Arts Submissions by deviantart members. Digital Painting What beginners should know. Top 5 Web Designs of 2012 As Chosen by the Designn Magazine. Interview Jude Christoper DeviantART community Volunteer and Digital Artist. Some of our founding editors and writers. A self-taught varied digital artist who specializes in web & graphics designing, video post-production and HTML & CSS coding. Loves clean code and simplistic designs! A professional writer and author who specialzes in writing short stories. Recently finished his very own novel - ‘The Magician‘ which can be found on his deviantART profile. A hobbyist writer and digital artist. Professional Web Designer A Professional designa and interface designer with a great taste for design. 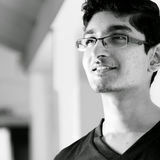 He also codes HTML and Wordpress themes and a provider of free resources on deviantART. These members - although some of them no longer work for the magazine, played a large role at the beginning; their support is not forgotten and is always appreciated. And whats more we’re recruiting for our next edition! Want to work with us? We’re recruiting some new folks to work on our next edition and if you think you’ll fit the roles below feel free to apply for the positions by sending our deviantART group a note with a short description of yourself and your qualifications/experiences. Graphics Designer Sub Editor Features Editor If your not looking for permanent work - you are welcomed to join us as either a contributing writer or contributing artist. Special: Some interesting tips and fact about our magazine to help you start your own! corners of the frame. An assignable lens ring allows for manual adjustment of focus, iris and zoom settings, while a professional-style (front to back) zoom rocker similar to that of the HXRNX5 delivers variable, servo and zoom control. Optical SteadyShot image stabilization with Active Mode compensates for greater degrees of camera shake to deliver stunningly smooth video—from wide angle to full telephoto shooting. More info - www.store.sony. intend to add, my suggestion is that you put this down on paper and finalized it before taking it to the next level – which is the software. your software lacks the necessary feature to allow it – then it’s time to shop for a new one! – Never let your software limit your creativity. Best Youtube /online Video Formats: Video Format: MP4/ MPEG/MOV/FLV Video Codec: H.264, MPEG-2 or MPEG-4 Audio Codec: MP3 or AAC (stereo channel) Frame Rate: 25frames or more. Capturing slow motion footage. This is something which is not talked of too often because some may consider it as unimportant or put back by thinking it requires specialised $5000 video cameras. But it is sometimes essential to capture videos in slow motion and thanks to modern day technology this feature is now available on some handycams at a very reasonable price - for example the Canon HF10/ HF100. Although most of them would only allow you to record short lengths of time at a frame rate of about 60-120 fps (normal frame rate is 24 fps) it is quite effective if put to correct use. For example you can capture a very dramatic video of a ball being thrown in slow motion with a camera shooting at 120 fps. One of the main points you need to keep in mind when shooting in slow motion is to have proper lighting, the higher the frame rate you will be shooting at the more light you would require. Another point to remember is that you don’t need to use a tripod when shooting in slow motion. This is mainly because capturing in slow motion removes most of the blurring from the video. So feel free to move your camera around and capture you scene properly and fully. Something you’d want to own! The new style of the modern wallet. As a designer I’d love to own this wallet! This is how they describe it “There are so many cool wallets on the market today, but we felt that something was missing. That’s why we made this wallet, the Evan wallet™. The Evan wallet™ is made out of leather and includes a band that secures the contents. We are Ainste™, inspired by Amazon, Einstein and Steve Jobs. We are devoted to creating unique products. The creator of Ainste is Ryan Kim. He is interested in photography and design. Even as a young child he had interests in designing new and different things. He is very excited to share his first design with you. The Smartphone Robot for Everyone! Romotive is back with a brand new bot! Romo is an affordable, personal robot that uses your iDevice as his brain. “Romotive builds accessible, highly functional, and flexible robotics platforms that are powered by a supercomputer already carried by millions– the smartphone. Our robotics platform adds everything that the smartphone is missing–movement, accessories, and physical capabilities that a true robot needs. The Light Bulb Reinvented! A wi-fi enabled, multi-color, energy efficient LED light bulb that you control with your smartphone. “LIFX is the smartest light bulb you’ve ever experienced. It’s a wifi-enabled, energy efficient, multi-colored bulb that you control with your iPhone or Android. LIFX gives you unprecedented control of your lights, reduces your energy costs, lasts up to 25 years and delivers an amazing range of experiences we think you’ll love. The top five most useful design websites as chosen by the Designn Magazine. These websites were selected according to their helpfulness, quality of articles and the number of submissions per week. We hope you find our selection useful! Every stunning painting has its own story of creation.â&#x20AC;? - Peretz Rosenbaum is one of the most influential graphic designers of the 20th century. He is responsible for the IBM logo, the old and arguably most recognizable UPS logo, the Westinghouse logo, and many other design icons. You know him as Paul Rand. - What we now call sans-serif typefaces were once known by a number of names: Egyptian, Antique, Grotesque, Doric, Heiti, Lineale, and Simplices. I think sans-serif works just fine, thank you. - Facebook uses a modified version of the typeface Klavika for its logo. Those are the few tips I can give you as a beginner myself. Clients From Hell! CLIENT: I need a message centre on our new website so I can log in and leave messages for my customers to read. Can you build this? ME: Why don’t you just send them an email? CLIENT: Because sometimes they don’t always have internet access. Can you build it or not? people for practice helps a lot! depth, as a form of expression. choose to be a photographer? MIGUEL: I didn’t. It just keeps happening to me! myself in any other way. DesignnMAG: Who is your Favorite Artist? I enjoy riding that wave. brings a lot of joy into my life. DesignnMAG: Professionally, what’s your goal? MIGUEL: I’d like to collect and range of emotions and find their meaning through the eyes and feelings of others. I believe I’m slowly getting there. My goal is to speed up a little. and help you out with it. Some Interesting Facts - The first website of the internet was “http://info.cern.ch/” launched in 1992 by Tim BernersLee. It is still active. -The boy silhouetted in the logo design of Hollywood studio Dreamworks SKG is William, the son of Robert Hunt (the illustrator hired for the design). Top 5 web designs as chosen by Designn Magazine. These selections were made according to not only their powerful and unique designs but also the work that has been put behind making such simple on the surface but complexly coded websites! A brief introduction to web designing and what you should keep in mind. webpage you are to design. on some while not on others. fonts by Google at www. quote – which is also unique! unique change for any website. element, such as at cartondock. darkens on click – just for fun! Free time? What free time?â&#x20AC;? Professional Digital Artist and DevinatART Senior Member. artist. My job is to take a black and white drawing (pencil, ink, or digital), and give it color, light, texture, mood, and environment. As a freelancer, it is also my job to seek out these collaborative efforts, manage my own time, and meet all deadlines and directions given to me by the client. Most importantly, it is also my job to just be a nice personable fellow that others donâ&#x20AC;&#x2122;t mind (too much) having to talk to... seeing as I donâ&#x20AC;&#x2122;t have an agent or project manager between myself and the client. lapsed creatively and found myself physically unable to pick up the pen again. As long as I keep my eyes on not burning out, all other art-centric goals will come as a mere side-effect...a passive benefit...to the simple act of finding the energy to keep going. Fortunately, with a good freelancing business, lots of solid feedback, and a group of artists and art enthusiasts by my side, this goal is also the most effortless to retain. Each comment, each addition to their favorites, each view, each “hello” in my Livestream...every bit of their presence makes this whole “art” thing totally worth it. anatomy. I just couldn’t correlate what was visualized in my head (not even what was presented in references) and translate them to my hand in the pencil sketching phase. However, I did find that as soon as I put down the pen and moved on to the tools for coloring, I was far more proficient. I kept focused on that aspect, the one that came a lot more naturally, and developed it the furthest. How have your practices changed over time? I make it a point to adopt their goals as my goals. terrible at math. The biggest influence that got me started in picking up a pad and pen was my uncle. He’s a high-profile landscape painter in Orange County, California, and as far back as I could remember I was constantly amazed at the works he makes. I thought it was just the most coolest thing in the whole universe. Truth be told, it still is. If given the choice...to either watch him pull together a brilliant rendition of the Laguna Beach shoreline, or see an early screening of Wreck It Ralph in Rich Moore’s home theater...the former would certainly prevail. So even as a little kid I wanted to be able to replicate whatever mystical wizardry that coarsed through his fingertips. I still have a long, long way to go. Who is your Favorite Artist? I have a number of artists I look up to. Of course, my uncle is way up there, but no doubt I’m highly biased in his favor. How will you describe your style? the same no matter what color the surface is. can’t see me roll on the floor squealing in euphoric trances. of an image, I’ll take a moment to inject more of each primary color into it. JCROXAS is an inspiring artist with a colorful collection of stunning artworks and has even been rewarded with the deviousness award for October 2012 on deivnatART and he is currently a community volunteer at deviantART for the Cartoons and Comics gallery. best everytime and learn from my mistakes. enough inspiration to those around me. acquainted with digital art and from there, I pursued and studied on my own until I chose to become an illustrator. trying to see the lessons from my mistakes. a big challenge for me, so I try my best to take things slowly but surely. them haha. That’s what I am really! and those things that affected me so much (in a good way). really put me to where I am now. We appreciate every bit of support made towards our magazine ! More info! Links, contacts, details and more! Advertise with us Would you like to advertise on magazine? If so please do send in your requests as a note/comment on our deviantART group. It is necessary that you note us with your advertisement at least a week before the due publication date. Complains/Issues If you have any complaints about our magazine or any issue to report please do send us a note to our deviantART group and we would do our best to correct ourselves. All mistakes are unintentional and we have done our best to proofread, check and gain permission for all the resources used on our magazine. We apologies for any errors. The free download pack available with our magazine is licensed for commercial or non-commercial use, with or without attribution. The magazine or its crew will take no responsibility for what these resources are used for. Each free digital edition of our magazine would be followed by a printed edition. You can pre-order the printed edition by sending our group a note and we shall instruct you for further payments. Keep in mind that only a limited number of copies are printed. Submit an article You are most welcomed to submit your design related articles to our magazine. Simply send in your article to our deviantART group via a note. (A free devaintART membership is necessary for sending notes) Only the best articles would be approved for publishing and if so you would be provided with credits along with your e-mail address/deviantART profile/ website as stated by you. Volunteer Since we are a free magazine all editors, writers and designers who work with us are volunteers. If you would like to work with our magazine as a volunteer please send our devinatART group a note with your details and how you hope to help us. We appreciated all the support we can get.